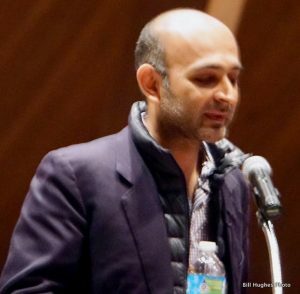 Mohsin Hamid, a native of Pakistan was the featured speaker Saturday for a benefit for the International Rescue Committee at the Episcopal Church of the Redeemer in Baltimore. For tonight’s literary happening, there was a $28 per person admission charge, (or per couple), which included a copy of the book. The Ivy donated 100 percent of the net book sales to the IRC. Ivy’s co-owner, Ann Berlin, was also on the program. She said in reference to the worldwide refugee crisis, “What’s going on right now is not OK.” She introduced Hamid. 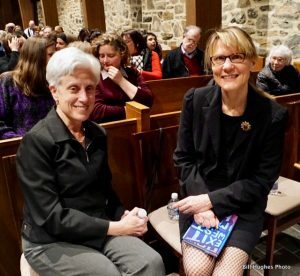 Redeemer’s rector, Rev. David J. Ware provided the welcoming remarks. Incidentally, just about every seat in the church was filled for the event. There was also a brief Q&A session moderated by Eduard Berlin, co-owner of Ivy after Hamid’s comments. In between readings from his novel, Hamid commented on his background and the current refugee crisis. Besides, Pakistan, he has lived in London, New York and California. This response cracked up the audience. The IRC operates in 39 countries and 28 U.S. cities, including Baltimore. It was founded in 1933, in NYC. Since 1999, the IRC has helped about 15,000 refugees to settle across the state of Maryland. Krummeck said her people had been in South Africa for “five generations, going back to 1815.” They had migrated from England. It was her “choice” to leave Capetown, South Africa, but she deeply sympathized with those who are currently being “forced out” of their homeland. Let me end with this note: Who do think was the moving figure behind the founding of the IRC? Try Albert Einstein. To learn more details about this benefit event, check out the Facebook page. To see eight more of my photos from this event, go to my Facebook page.